The built-in camera is probably one of the most widely used aspects of any of Apple’s fantastic iOS devices. Gone are the days of consumers using a mobile telephone purely for phone calls and text messages, meaning that the iPhone and iPod touch are now used daily by most owners for a wide variety of activities including snapping photographs wherever they are. The introduction of the camera grabber option on the lock screen has meant that we now have quick access to the camera to ensure we don’t miss that perfect shot, but the InstantCamera tweak from Cydia also has a place on a jailbroken devices for photography fans. InstantCamera is one of the latest packages to land on the Cydia store and offers pretty much the exact functionality that the name of the tweak suggests. Installing the package will allow users to have almost instant access to the Camera app from anywhere on the system. 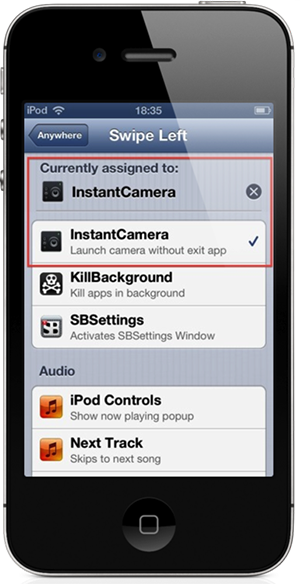 This negates the need to exit the currently running application or enter the multitasking switcher tray to invoke the native Camera app to capture an image. The developer of the tweak achieves this level of camera access by hooking into the fantastic Activator library by Ryan Petrich and allowing users the ability to set a custom gesture for the feature to be invoked. Although no additional icons are installed on the device, users can head on over to the Settings.app and choose the custom gesture that they would like to use to open the Camera app. It is then a simple case of using that gesture from within any running application to capture the perfect image. One of the extremely useful aspects of InstantCamera is that it actually remembers the current state of the device before the Camera app is launched. This means that if a user is in the middle of browsing the Redmond Pie website through Mobile Safari and then decided to invoke the camera using InstantCamera, when the picture is taken, the user would be returned straight back to Safari to carry on. Not exactly mind blowing functionality but extremely important from a user experience perspective. InstantCamera is available for $1.00 on the BigBoss repository and requires a jailbroken iPhone or iPod touch running iOS 6 or higher.